Don’t have a lot of cash saved for a down payment and worried your home-owning dreams will never become reality? Guest broker Barbara Ann Rogers of William B. May lays out your options in this week’s Buy Curious. Getting together the funds needed for the down payment on an apartment in NYC is a major challenge for most buyers—even those with healthy incomes. While condos are fine with 10% down, many co-ops require 20% of the purchase price or more, especially in Manhattan. Conventional mortgage financing usually requires 20% down as well, regardless of the type of property you’re buying. 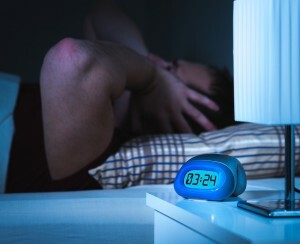 There are some alternatives, although you may end up paying more in monthly costs due to higher interest rates, required insurance costs or both, and your choice of properties may be limited by program-specific requirements. Federal Housing Administration (FHA) loans: Buying an apartment with an FHA-insured loan means that a buyer can purchase a home with a much lower down payment than the 20% required by most mortgage lenders. In fact, down payments can be as low as 3.5% of the purchase price. While FHA interest rates are actually quite competitive versus bank rates, the additional fees and required insurance can drive up monthly payments. For that reason, Adam Missry, a loan officer with Sterling National Bank, rarely advises them to clients. While you’d still need to get Private Mortgage Insurance (since PMI is required by banks anytime you put less than 20% down on a new home), it will be cancelled on a conventional loan once you’ve paid the mortgage down to 78% of the original purchase price or appraised value—whichever is lower. Housing Development Fund Corporation co-ops: HDFC co-ops are another alternative for those on tight budgets. These apartments sell 40% to 50% below market rates but come with restrictions on maximum income and, often, profits you can earn from any eventual sale. Down payments for these co-ops—which are in limited supply—are standard, but since the overall sale prices are so low, you’ll be putting less money down. The income limits might help some buyers get a foot in the door, but Missry says that HDFC co-ops come with their own problems. “You’ll be limited in terms of lenders, which usually translates to higher rates,” he says. State of New York Mortgage Agency loans: SONYMA offers several low down-payment programs for first-time homebuyers and military veterans, requiring a minimum of 3% down. SONYMA does allow co-op purchases as well, so this may be a better alternative to an FHA loan for some New Yorkers. SONYMA has a long list of requirements for what kind of condos and co-ops qualify for a loan, including that the apartment must be in a project with a minimum of 10 units and that at least 70% of the sold units in the property be occupied by their owners. Co-purchases: For those lucky enough to know someone, like a parent, who is willing to help bankroll their home, co-purchasing is an option. In a co-purchase, both parties would need to be on the mortgage and deed (for a condo) or stock and lease (for a co-op). Not all co-ops allow co-purchases, but it’s generally allowed for condos. Fannie Mae HomePath properties: These are properties that Fannie Mae “originally lent on that have gone bad and been foreclosed on,” says Missry. Buyers need only offer up a 5% down payment and most importantly, “there’s no PMI at all,” he says. “As an incentive to sell the places quickly, they will allow less down with no mortgage insurance.” While these properties are typically few and far between in Manhattan, there are a number of them in Brooklyn and Queens. 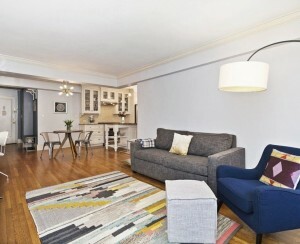 Inwood 1-bedroom/1-bathroom co-op, $199,000: This spacious pre-war co-op at 420 W. 206th St. between Ninth and Tenth Aves. has a dining section just off the kitchen and even has in-unit laundry. The elevator building allows 90% financing, so you’d need to put just $19,900 down. Harlem 1-bedroom/1.5-bathroom condo, $395,000: This south-facing duplex condo at 239 W. 135th St. between Frederick Douglass and Adam Clayton Powell Jr. Blvds. has in-unit laundry, one-way privacy glass windows and two separate entrances with elevators reaching both floors. It’s also in an FHA-approved condo building—one of the few in Manhattan. But you’ll have to act quickly here as approval expires in March! If you put down the minimum 3.5%, that’ll be $13,825. Bushwick 1-bedroom/1-bathroom co-op, $105,000: The maximum annual income to purchase this HDFC co-op at 1095 Bushwick Ave. between Woodbine and Palmetto Sts. is $72,150 for one buyer or a combined $82,500 for two. A family of three cannot exceed $92,775. 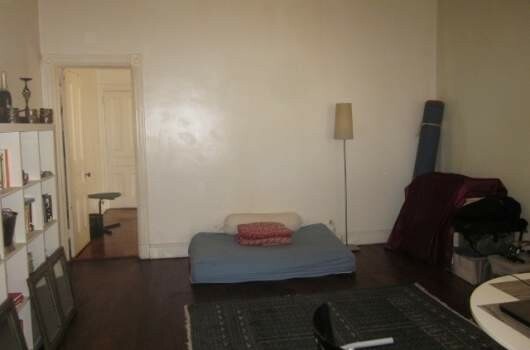 The loft-like 1-bedroom has high ceilings and an eat-in kitchen, but it needs some upgrading. Maintenance is $662/month. The minimum down payment here is 20%, so if you can swing $21,000, you’ll be fine. 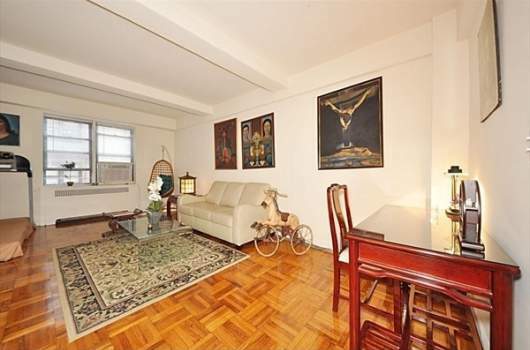 Kensington 1-bedroom/1-bathroom co-op, $199,900: This co-op at 350 Ocean Pkwy. between Ave. C and Cortelyou Rd. in Kensington has good closet space and room for both a living room and a dining area. The post-war building allows for 90% financing, so if you have $19,900 at your disposal, you have the down payment. Crown Heights 1-bedroom/1-bathroom condo, $499,000: This FHA-approved Crown Heights building at 892 Bergen St. between Classon and Franklin Aves. was constructed in 2010 and features a doorman, on-site parking and a shared garden. 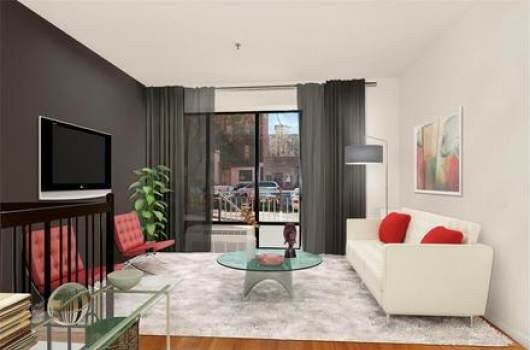 The corner unit has stainless steel appliances, floor-to-ceiling windows and in-unit laundry. The FHA approval expires here in April, so if you act fast you’ll still be able to take advantage and only need to put down 3.5% ($17,465). Jackson Heights 1-bedroom/1-bathroom co-op, $149,000: Just outside of the Jackson Heights Historic District, this 1-bedroom at 88-09 35th Ave. between 88th and 89th Sts. has hardwood floors and lots of closets. The elevator in the building is brand new and the electricity has recently been upgraded in all the apartments. The post-war building allows 85% financing, so you only need to put $22,350 down. Rego Park 1-bedroom/1.5-bathroom condo, $569,000: One of the only FHA-approved buildings in Queens, the Millennium at 63-36 99th St. between 63rd Dr. and 63rd Rd. features such luxuries as a fitness center, a spa and a roof deck. The 991-square-foot unit offers an open kitchen with granite countertops and stainless steel appliances, a stacked washer and dryer, marble bathrooms and a video intercom system. Since you only have to put down 3.5%, all you need is $19,915. One of the only FHA-approved buildings in Queens, this Rego Park condo at 63-36 99th St. between 63rd Dr. and 63rd Rd. features a fitness center, spa and roof deck. Since this $199,900 Kensington co-op building at 350 Ocean Pkwy. between Ave. C and Cortelyou Rd. permits 90% financing, you only have to put $19,900 down. 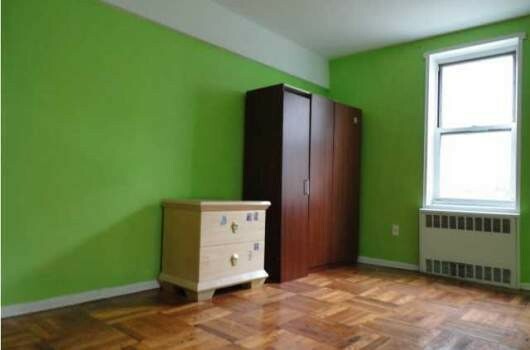 This $149k co-op at 88-09 35th Ave. between 88th and 89th Sts. in Jackson Heights permits 85% financing. 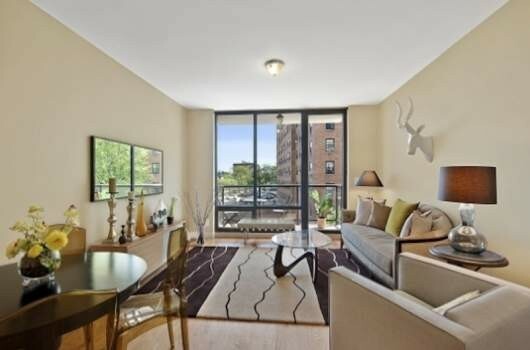 This $199k pre-war Inwood 1-bedroom at 420 W. 206th St. between 9th and 10th Aves. allows 90% financing. This duplex unit at 239 W. 135th St. between Frederick Douglass and Adam Clayton Powell Jr. Blvds. 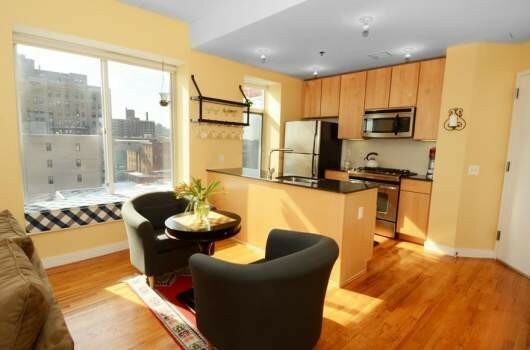 is in one of the few FHA-approved condo buildings in Manhattan. The FHA approval for this Crown Heights building at 892 Bergen St. between Classon and Franklin Aves. expires in April, so you’d need to act fast. 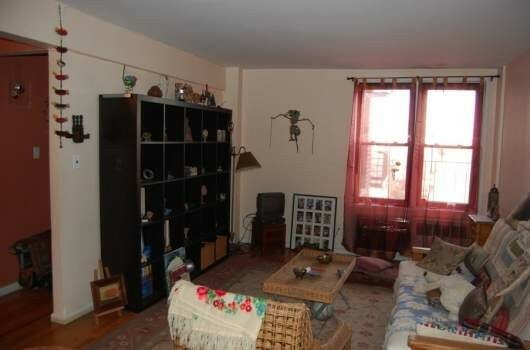 Located in Bushwick, this 1-bedroom co-op at 1095 Bushwick Ave. between Woodbine and Palmetto Sts. has strict income restrictions. An individual buyer cannot earn more than $72,150/year.